Replies: 7 (Who? ), Viewed: 23570 times. #1 13th Dec 2015 at 7:55 PM Last edited by justJones : 6th May 2018 at 11:07 PM. 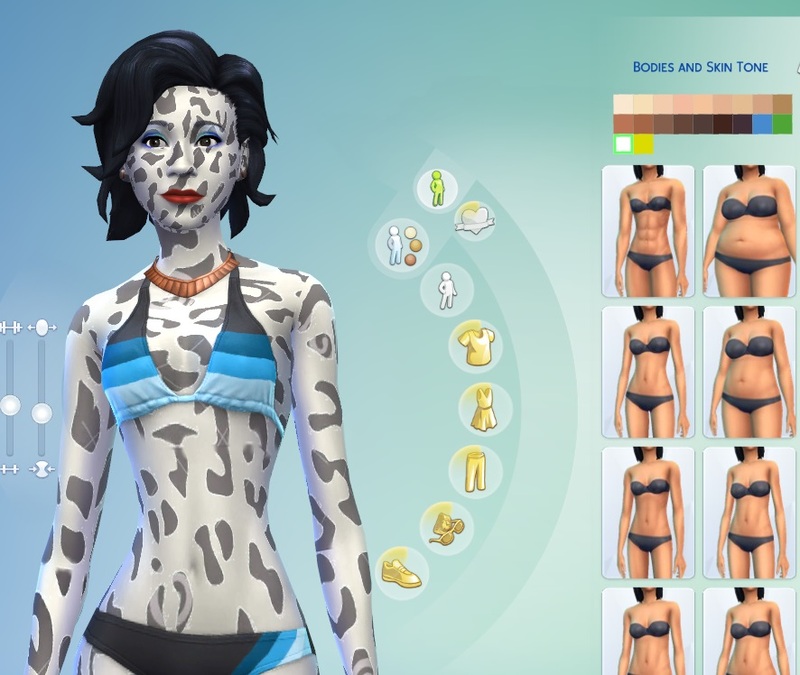 What this tutorial does: Show how to create a custom TS4 skintone using TS4Skininator, including skin color and overlays. What this tutorial does not do: Teach you how to use an image editor. For this tutorial I'll be making a leopard skin in two colors: yellow and white. I'll use overlays for the spots and make them appear darker as the sim gets older. 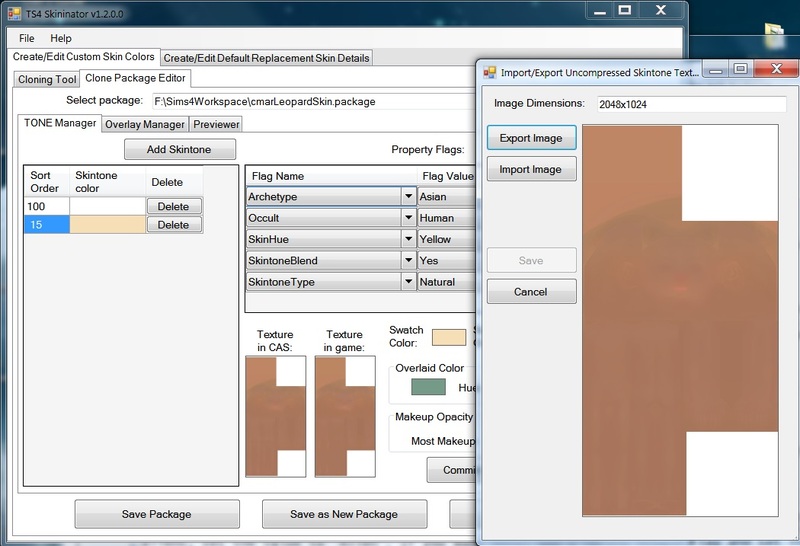 First, we clone two game skintones as new custom content. You could also clone one skintone and add a skintone to it later. When we run Skininator, the list of clonable skintones in the 'Cloning Tool' tab will be empty. 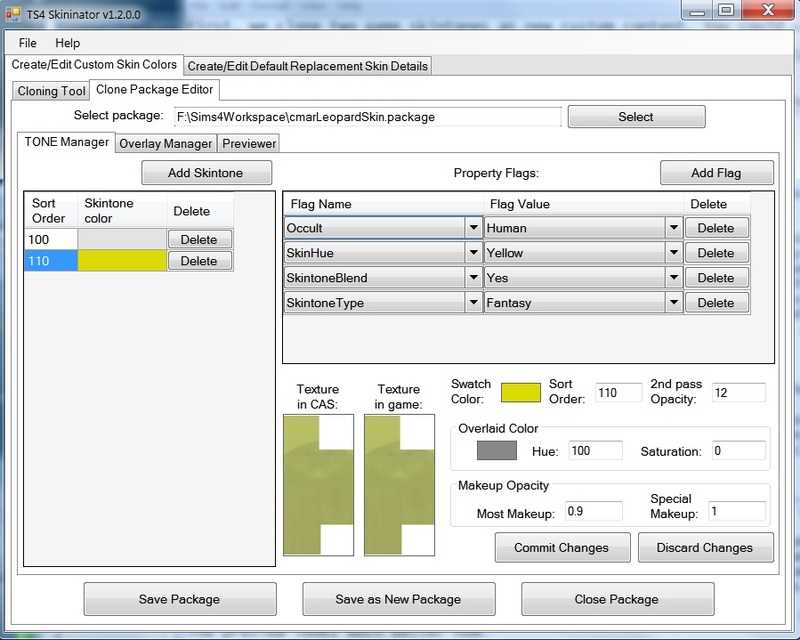 If you were cloning from a custom skintone package you'd select the 'Custom package' option. 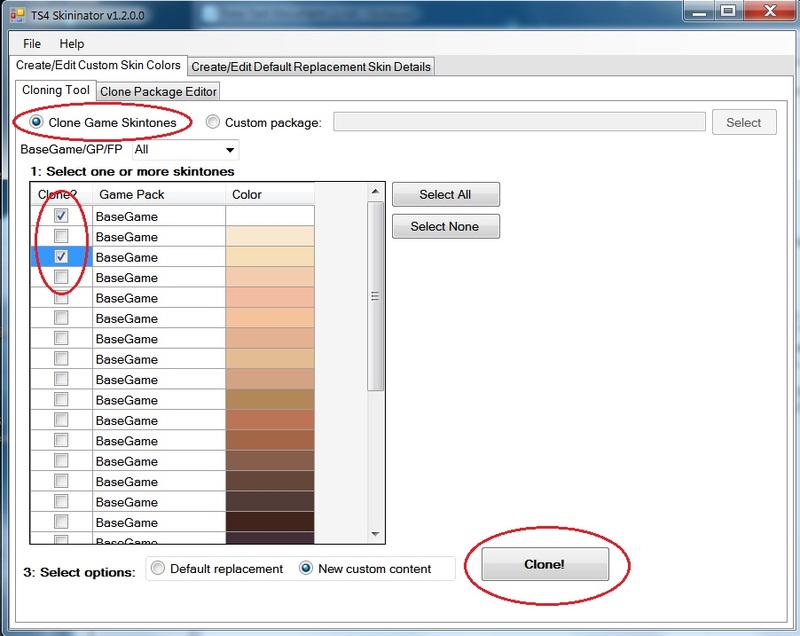 In our case, we select the 'Clone Game Skintones' option and a list of skintones will appear. You can filter it by basegame or game pack if you wish. There's a blank white skintone first in the list, which I think is the mannequin skin. I'll clone it and the second lightest skintone by checking the boxes next to them and then clicking the big 'Clone!' button. Give the package a name and save it where you can find it. 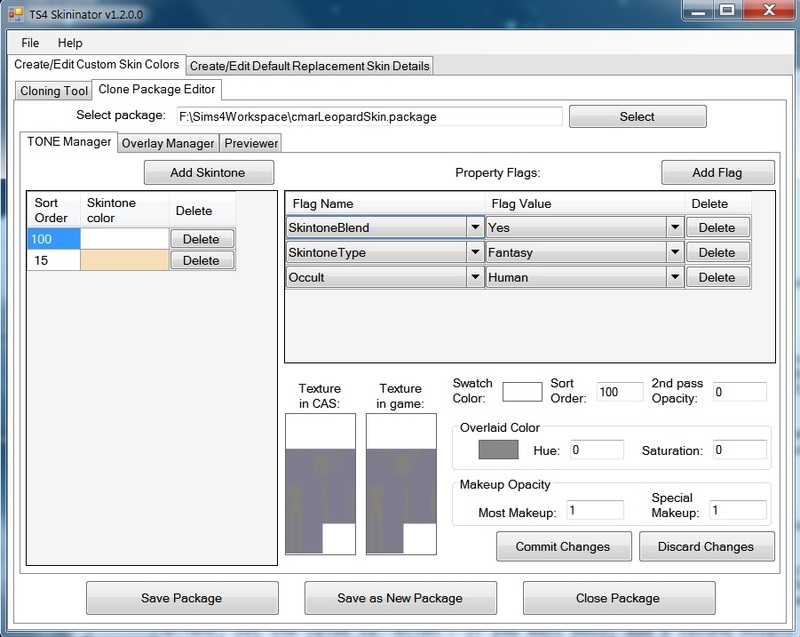 Now we move into the Clone Package Editor tab. Select the package you just saved. 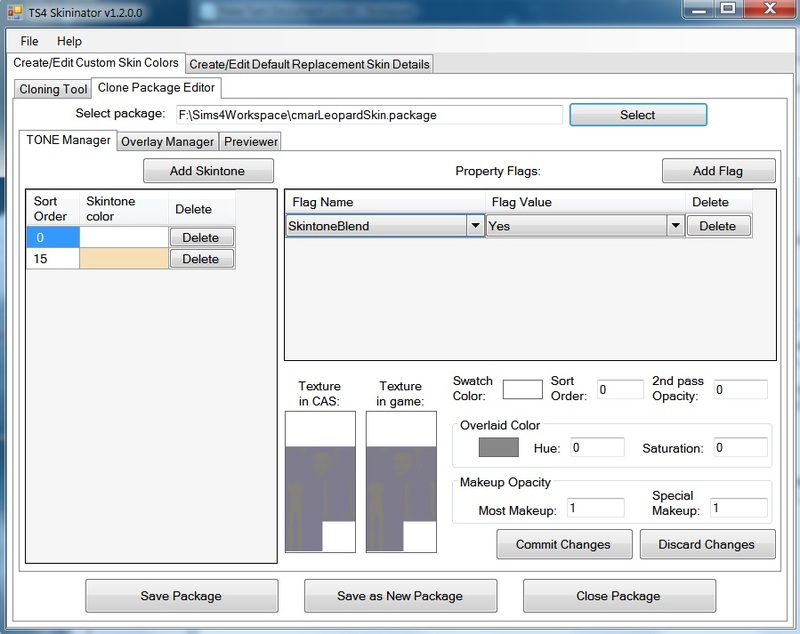 The two cloned skintones will appear in the list section and the settings for the first one will appear on the right. First, I need to set the skin property flags the way I want. The first cloned skintone is a special one and only the property flag of SkintoneBlend appears for it. (No, I don't know what that means, only that it appeared in all skintones with patch 1.13.) I'll add the SkintoneType flag and set it to Fantasy. There's no SkinHue value that would be meaningful for white skin so I'll skip that. And most important, I'll add the Occult property flag and set it to Human so the skintone will show up for human sims. (If you want it for aliens, set the value to 'Alien'. If you want both, add a second Occult flag and set it to Alien.) I'll click the 'Swatch Color' square, select white just to make sure a valid color is included, and set the sort order to 100 so the skin will appear after the game skintones. Last, I click the 'Commit Changes' button. Now for the second tone in the list. In this case I need to export the skin color image and modify it. Click the 'Texture in CAS' image and a popup will appear with the image and some buttons. Click 'Export Image', name and save the DDS image. Open it in your favorite image editor and use a hue paintbrush to change the color to a nice gold. Then save it as DDS with compression DXT5 and Generate MipMaps. (The names of these options may differ depending on which image editor you're using.) Back in the Skininator popup, click the 'Import Image' button and import the modified image, then click the Save button. Click the 'Texture in game' image and import and save the same image there. Now for the property flags. Skin randomization for human sims is controlled by the archetype flags according to my tests - skins with archetypes are picked before skins without them, and the more archetypes the more often the skin is picked. In alien sims all skins enabled for aliens have an equal chance of being picked so unfortunately there's no way to disable randomness. In this case, I don't want this skin showing up randomly so I'll remove all the archetype flags. (There may be none, one, or many.) I'll change the SkintoneType to Fantasy. SkinHue is already Yellow. Click on the Swatch Color block and select a gold to match the skin color. Change the Sort Order to 110 to put it at the end of the list in CAS. Click 'Commit Changes' and go to the preview tab. The preview looks a bit too green to me, so I'll go back to the TONE Manager tab and set the Overlay Color saturation to 0 and commit. The preview looks much better now. A note about the Overlaid Color: I have no clue how the devil EA composites that color into the final skin image. For low saturation values it seems to do what you'd expect - make a small adjustment to the color. At higher saturations it may give you a completely different color and/or create splotches of purple or whatever in the highlights or shadows. I haven't been able to duplicate that in the Skininator preview. My advice is to keep the saturation zero or very low unless you don't mind using the game as your previewer. And a note about the 2nd pass opacity: This seems to refer to a second pass of compositing the grayscale body skin details with the skin color image. Higher values seem to result in a lighter color, and EA uses them in the darker skin colors, maybe to bring out the details more. Now for the spots, which I'll add in the Overlays. With either skintone selected, go to the Overlay Manager tab. First, delete any existing overlays. (EA put some overlays in for children that don't do anything visible in the game.) Now, click the Add Overlay button. A new, blank overlay will appear. I have four overlay images ready with leopard spots on a transparent background and varying levels of transparency of the spots, but for this exercise you can use any image with a transparent background that you want. I duplicated the transparent upper right and lower right corners in the skin color images, but I don't know if this is necessary. Click on the image display between the list and the settings, which should be blank at this point. You'll get that popup with import and export buttons again. Import your image. For my fully dark leopard spots, in the ages/genders I'm going to select adult and elder, male and female. Click Commit Changes. Now I'll add my other three leopard spot overlay images, selecting Young Adult male and female for the slightly transparent spots, Teen male and female for the more transparent spots, and Child male and female for the most transparent spots. When all the overlays are imported and all changes committed, I click 'Apply to all skintones in Package'. This gives all skintones the same list of overlays. (I really need to put an 'Are you sure?' popup for that.) Anyway, a quick look in the previewer confirms that the spots are there and get darker as the sim gets older. Now I'll save the package using the Save button at the bottom of the window and test in the game. The skins show up at the end of the skintone list, and the spots vary from barely visible in children to completely black in adults and elders. 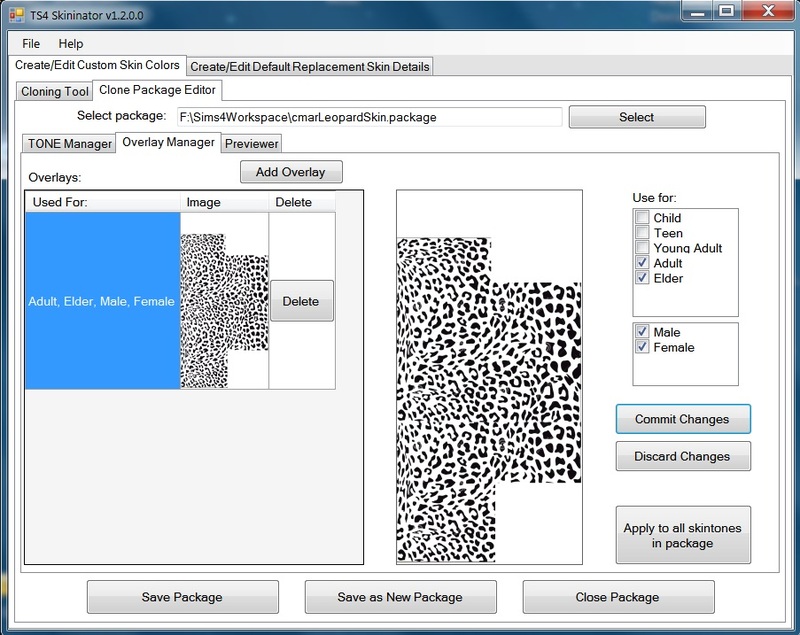 You don't have to use overlays, of course; any pattern or details you want can be put directly into the skin color image. There's a download available in the Skininator post with images of how the image is mapped to the body that can be used as a guide. However, if you want different details for different ages or genders, overlays is the way to go since the same color image is used for all ages and both genders. When I try darker tones with a textured skin, it gets all pixelated and splotchy. Is there anyway to fix this? If you think the actual creation / compression of the texture might be a problem, maybe make a new thread specifying what you are using and incuding some screenshots? Seeing as this tutorial is explicitely not about image editing .. Thank you for this wonderful tool and tutorial, so I was able do make my first skintones! #5 20th Dec 2015 at 12:32 PM Last edited by mammut : 20th Dec 2015 at 5:29 PM. I made three blue-colours which I imported in the tone manager. Then I imported one transparent image with a pattern into the overlay for all ages and genders, and the skins look all right in my game. But then I noticed that one EA colour is overwritten by one of the three blue skins from the tone-colours. You can see that here (just scroll down a bit - my post with the two "blue" images). If you still have the package that didn't work correctly I'd like to see it, if you could upload it. Meanwhile I'll check my code in case I'm not updating resource IDs correctly. I have a set of skins made by someone else, and they have weird pixelated areas. would I be able to fix this? if so, how?